The Royal Typewriter Company was founded in January 1904 in a machine shop in Brooklyn, New York by Edward B. Hess and Lewis C. Myers. 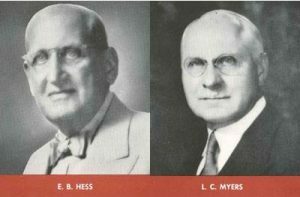 In 1905, with their limited cash running out, Hess and Myers turned to Thomas Fortune Ryan, the wealthy financier. They demonstrate their machine which has numerous innovations including: friction-free, ball-bearing, one-track rail to support the weight of the carriage, a new paper feed, a lighter and faster typebar action with complete visibility of the words as they are typed. Ryan is impressed and puts up $220,000 in exchange for financial control. 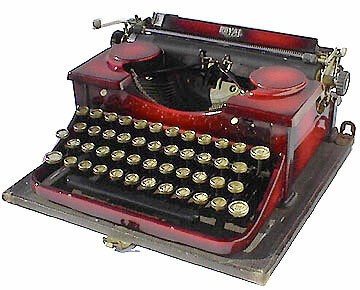 In March 1906 the first Royal typewriter, the Royal Standard, was sold. The Royal Standard was different from its competition in that it had a “flatbed” design rather than the traditional “upright” design used by other typewriter manufacturers. 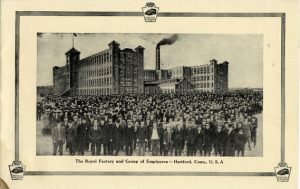 With demand increasing, Royal purchased 5¼ acres in Hartford, Connecticut as the new site for its manufacturing facility. Original plans called for floor capacity of 250,000 square feet and will cost $350,000 to build. 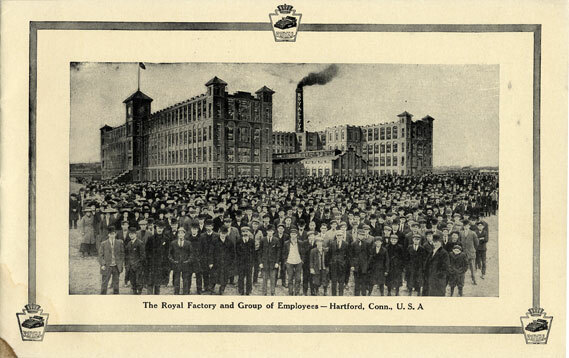 In 1908, Royal will begin manufacturing here. In 1911, Royal introduced the Royal 5 typewriter which also utilized the “flatbed” design. Royal’s first model utilizing the “upright” design was the Royal 10 which came out in 1914. Original models had two beveled glass panes on each side. The Royal 10 was an immediate success. In 1926 Royal introduced the “Roytype” brand name for its line of typewriter ribbons and carbon paper. Royal’s introduction of its portable line of typewriters in the late 1920’s was an immediate success and launched the company to become the world’s #1 selling typewriter brand. To promote the ruggedness of its typewriters, George Edward Smith, president of Royal bought a Ford-Stout tri-motor airplane in August 1927. This plane will drop over 200 typewriters in crates with parachutes to dealers over the eastern seaboard of the USA. Royal will eventually deliver over 11,000 this way with only 10 being damaged. In January 1941, Edward B. Hess, one of Royal’s founders and vice presidents, died in Orlando, Florida. Hess was a prolific inventor and held over 140 patents relating to the typewriter. World War II brought tremendous change to Royal. In order to aid the war effort, Royal converted its manufacturing to war work exclusively. Royal would manufacture machine guns, rifles, bullets, propellers, and spare parts for airplane engines. It wouldn’t be until September 1945 that Royal would start typewriter production full-time again. In 1947, Royal would produce, in limited quantity, a gold-plated version of its popular Quiet Deluxe model. Ian Fleming, the British novelist who wrote the James Bond novels, would use one. 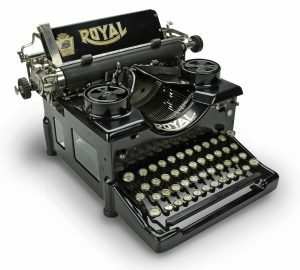 Other typewriter manufacturers would utilize Royal’s innovations in their typewriters. In 1947, Royal would win patent suits against Remington and LC Smith & Corona. In February 1950, Royal introduced its first electric typewriter. Lewis C. Myers, one of the founders of the Royal Typewriter Company, died in Freeport, New York at the age of 84. In April 1954, the Royal Typewriter Company announced its plan to merge with McBee, a leading manufacturer of accounting and statistical machines and supplies. By July, Royal stockholders approved the plan and Royal McBee was formed. From 1954 to 1964 sales soared from $84.7 million to over $113 million. Royal McBee was consistently listed as a Fortune 500 company. In December 1964, Litton Industries’ stockholders approved the acquisition of Royal McBee. The deal became final in March 1965. Litton would change the name of Royal McBee back to Royal Typewriter and reorganize the company into five divisions: Royal Typewriter, Roytype Consumer Products, Roytype Supplies, McBee Systems, and RMB. October 1966 saw Litton announce plans to acquire the English typewriter producer, Imperial, through its Royal Typewriter division. In January 1969, Litton Industries further cemented its hold on the typewriter market by purchasing the German typewriter manufacturer, Triumph Adler. Almost immediately, the USA government filed an anti-trust suit against Litton accusing it of creating a monopoly. The FTC ruled in March 1973 that Litton had to divest itself of Triumph Adler. Litton would appeal and, in a rare reversal, the FTC issued a ruling in April 1975 stating that Litton could keep Triumph Adler. Sales continued to climb and by 1982 sales in North America of Royal and Triumph Adler totaled over $600 million. In April 1986, Olivetti, the Italian typewriter/computer manufacturer, announced plans to purchase Triumph Adler and Royal from Volkswagen. For nearly two decades Royal was a part of the Olivetti family. In September 2004, Royal became a private American company again. 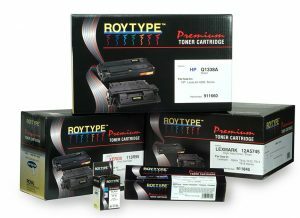 Now known as Royal Consumer Information Products Inc., Royal’s product line has evolved to include cash registers, shredders, PDAs/electronic organizers, postal scales, weather stations, and a wide range of original and compatible/remanufactured imaging supplies supporting today’s most popular printers, faxes, and copiers.